VTV.vn - Secretary of the Ho Chi Minh City Party Committee Nguyen Thien Nhan paid a pre-Tet visit to the leaders and people of the border area in Ben Cau district in the southern province of Tay Ninh on January 29. 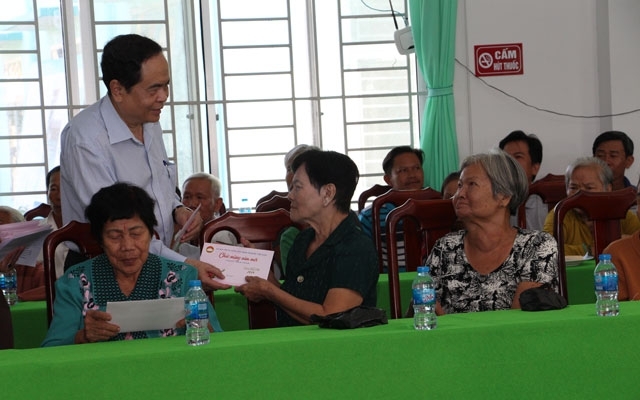 Politburo member Nhan presented VND500 million (US$21,500) as a gift from the HCM City Party Committee, authorities and people to the poor, near-poor and disadvantaged households in Tay Ninh on the occasion of the 2019 Lunar New Year (Tet). Visiting and presenting gifts to 100 needy households and Agent Orange victims in Ben Cau district, the HCM City leader paid tribute to the local people for their asset and flesh sacrifices for the national resistance war against the imperialism and colonialism in the past. On the occasion, Nhan and the Tay Ninh leaders offered incence at a memorial monument dedicated to HCM City youth volunteers in Ben Cau’s Long Phuoc commune. On the same day, President of the Vietnam Fatherland Front (VFF) Central Committee Tran Thanh Man visited and presented Tet gifts to disadvantaged workers, social welfare beneficiaries and poor households in the Mekong Delta province of Hau Giang. VFF President Tran Thanh Man presents Tet gifts to social welfare beneficiaries in Thanh Xuan commune, Chau Thanh A district, Hau Giang province. At the Nha Be Garment Corporation in Vi Thanh city, Man presented 50 gifts, worth VND1 million each, and essentials in service of Tet to underprivileged workers, in addition to 100 gifts from the Hau Giang provincial Confederation of Labour and another 100 from the Corporation. The VFF leader offered Tet greetings to all the workers, while praising the efforts made by local authorities in caring for the wellbeing of labourers. Visiting Thanh Xuan commune of Chau Thanh A district, Man presented Tet gifts to 100 social welfare beneficiaries and low-income households. He asked the local administration to increase support for underprivileged families and revolutionary contributors. On the occasion, the VFF Central Committee presented VND330 million (nearly US$14,300) and the Ho Chi Minh City VFF Committee donated VND500 million to the Hau Giang Fund for the Poor.